On Wednesday, 21 August 2013, at 1:45 GMT in 28° Aquarius 11', there is a second exact Full Moon with Sun in Leo and Moon in Aquarius, following the previous Full Moon on 22 July 2013 (click here for details). All Full Moons energetically begin two days before and end two days after exact Full Moon. They are active and highly charged moments, representing the apex of the lunar cycle, with the function of bringing balance between polarities identified by the qualities of the sign of the Sun and the Moon. 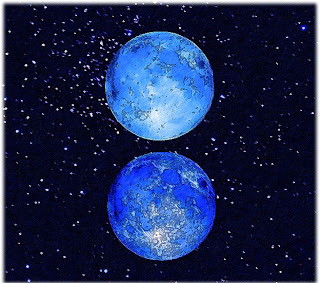 When a Full Moon occurs two times in the same signs, this is traditionally called a Blue Moon, which provides a major emphasis on healing and mending the fractures of our soul, both at an individual and collective level. When there are two Full Moons occurring in the same signs, it is like having an extended Full Moon, encompassing the whole time from the first to the second Full Moon. Hence the whole period in which the Sun has transited Leo may have been rather intense for sensitive people, especially those with relevant patterns in Leo or Aquarius, such as Sun, Moon, Ascendant, Midheaven and Nodes. The key of a Full Moon involving Leo and Aquarius is the quest for our true identity and its fragmented pieces, which in this particular context is ideally the search for who we consciously choose to be. We can either choose to strive in order to fit with a definition of who we should be according to social norms and belief systems derived by others, including alternative and original ones, or we can elect to embrace our deeper authentic nature, even if this is still mysterious and does not seem to fit anywhere. More ideally the work involves balancing both attitudes, being your authentic self and also finding ways to cope with the limitations of the social world, letting go of the related antagonism, healing excesses and finding ways that allow ordinary and non-ordinary to harmoniously integrate. Leo and Aquarius combined again in this Blue Moon bring light into what has already been achieved regarding our identity - i.e. the understanding we have of ourselves, where we feel at ease and competent, including the gifts we bring to, and receive from, the world, family, friends, community and network – and also into what we deeply long for, those essential missing parts within us and the collective. This reawakens the spirit of the visionary quest, which implies provisionally leaving what is familiar in order to explore forgotten and controversial territories and retrieve a wider definition of who we are. The Full Moon in Aquarius highlights a multidimensional perspective and a shift of consciousness that can bring true change. In this context, the Blue Moon brings the potential of releasing destructive elements of change and mending ancient wounds, while focusing the energy on the luminous side. Here we have the golden opportunity of letting go of harmful projections towards others, refusing to engage aggressively or possessively with whom may appear to be in the way, while opening our hearts and move on. Intense dynamics between Since the intense aspect between Jupiter and Uranus during this Full Moon could trigger significant tensions and disorders, this golden opportunity requires an investment of courage and willingness. At this stage, once we consider any tension we experienced during the previous Full Moon, and whatever has affected us so far, we may be aware of the grievances involved and the forlorn strategies we employ to harm ourselves and others so as to avoid letting them go. We need to consciously choose to stop manipulating other people into representing parts of our soul, including blaming ourselves for whatever seems to go wrong in others. We need to resolve to abstain from reacting in damaging ways both for ourselves and those around us, regardless whether we feel to be right or wrong. An effort is required so as to avoid any situation that keeps us trapped into fight and resentment, directing the energy of the fight towards our visionary vertical quest. Instead of wasting further energy to stubbornly defend our own perspective and promote separation in our life, we can gently forsake the attachment to our ideas, issues, resources, relationships, communities, leaving for a loving quest into the unknown. We can feel entitled to take a healing break, refusing to continue anything that causes ongoing struggles and efforts. Then, later we can return, sharing the gifts we have acquired during our absence with those we left, connecting our individual journey with the collective. And when we do return, we need also to be aware that time is needed to integrate the new with the old, to help it ground and serve the environment, and that there will be some delay before we can receive a full blessing from certain people and places. The above does not necessarily involve major practical upheavals in our life. You can just take a few days or even hours to experience this. We may leave for a very short time, or remain where we are or with people we know, yet engaged in meditations, ritual, dances or any practice where we can be with others exclusively in a healing way. Well, I am happy if you join me, or I am happy to join you. I wish you a luminous Blue Moon. © 2013 Franco Santoro, info@astroshamanism.org. All rights reserved.